Good morning! Temperatures this morning are starting off in the low to mid 60s. 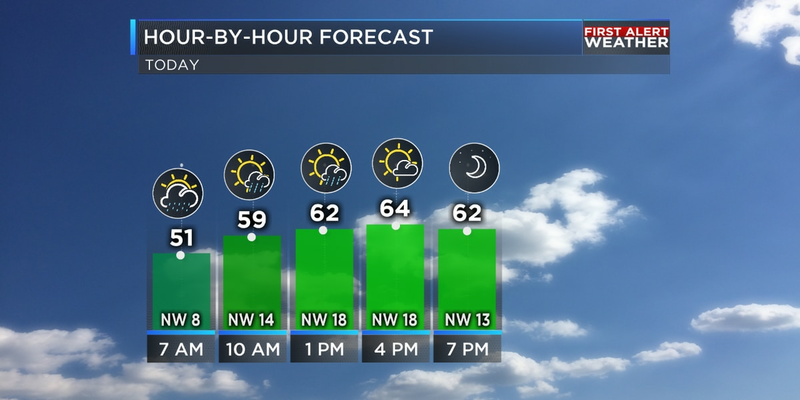 You will want to grab the umbrella out the door as scattered rain is possible this afternoon. Expect clouds to dominate the forecast today, highs will continue to stay warm in the mid to upper 70s. Strong to severe storms are possible later tonight and into the overnight hours. 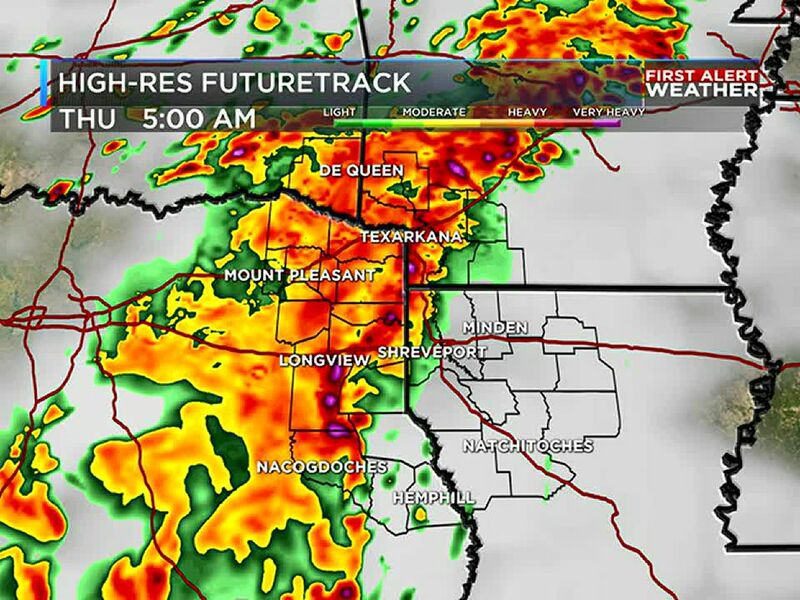 A strong frontal system will be pushing through the ArkLaTex, prompting widespread rain and storm activity. The Storm Prediction center continues an Enhanced risk across fast western portions of NE Texas, with a slight risk encompasses most of the ArkLaTex. Main threats are damaging wind gusts and hail, but an isolated tornado or two can't be ruled out. Localized flooding is possible with heavy rainfall in the forecast as well. A Flash Flood Watch has been issued for portions of southwestern Arkansas, a few counties along and south of I-20 in E. Texas, and the northern half of NW Louisiana from 7pm tonight to 7pm tomorrow night. 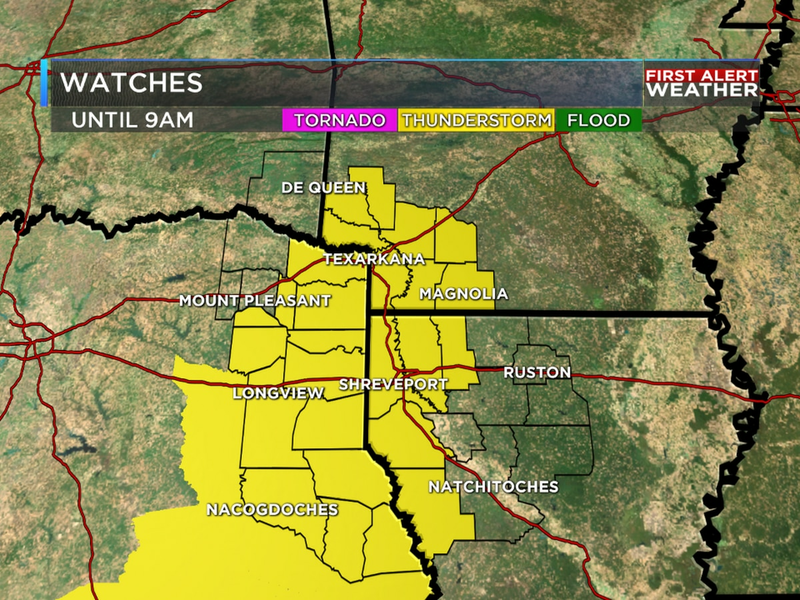 This does include the Shreveport-Bossier area. 2-3" of rainfall is possible with this system. Highs on Thursday are in the low 70s. Download the First Alert Weather App for the latest information! Once we get to Friday, we will have a brief break in the temperatures with highs in the upper 60s. You will want the jacket Friday evening and temperatures will be falling into the 40s and 50. Easter weekend is looking great for any outdoor plans! Temperatures will be in the upper 70s, low 80s across the area with lots of sunshine. Looking ahead to next week, a few showers are possible Monday. Highs stay in the low 80s. Scattered rain chances return for Tuesday.